Also serving communities of Pleasant Hill. There are 5 Assisted Living Facilities in the Crossville area, with 4 in Crossville and 1 nearby. The average cost of assisted living in Crossville is $4,450 per month. This is higher than the national median of $3,346. Cheaper nearby regions include Cookeville with an average starting cost of $2,513. To help you with your search, browse the 10 reviews below for assisted living facilities in Crossville. On average, consumers rate assisted living in Crossville 4.2 out of 5 stars. Better rated regions include Cookeville with an average rating of 4.3 out of 5 stars. Caring.com has helped thousands of families find high-quality senior care. To speak with one of our Family Advisors about assisted living options and costs in Crossville, call (855) 863-8283. Crossville, Tennessee is known as the Golf Capital of Tennessee, which might appeal to some active seniors who want to try out the nine courses within the city. Around 25 percent of the population in Crossville is 60 years old or older and to accommodate this group, the city has four assisted living facilities for seniors to choose from. In Tennessee, the Office of Health Care Facilities governs assisted living facilities. Snowy winters and warm summers appeal to some residents of Crossville, Tennessee; although, some seniors might find 12 inches of snow per year difficult to handle. The average winter low is 25 degrees Fahrenheit in January. The highs average around 84 degrees Fahrenheit in July, the warmest month. A better than average air quality might help some senior citizens to breathe a bit easier. Crossville’s air quality is rated 68, which is a nice improvement from the national average of 58. Air quality levels are rated on a scale of one to 100, with one being the worst. The low cost of living in this city might give senior citizens a bit more financial freedom. While the average cost of living in the country is 100, Crossville’s is much lower at 82.8. Even health care costs, which come in at 96, rank below the national average. Unfortunately, crime in Crossville might be a negative mark for some seniors. Violent crime here is ranked 91, which is much higher than the 31.1 United States average. Even property crime rates are much higher. Crossville has a ranking of 89.7, which is a considerable increase over the national average of 38.1. Senior citizens can enjoy a rich cultural experience through the Fair Park Senior Center. This center hosts a variety of classes, events, and van trips. Guitar lessons, line dancing, a stamp club and self-defense training are a sampling of what’s available. It also participates in the Silver Sneakers fitness program for seniors. The Crossville area is home to world-class medical facilities, including Cumberland Medical Center, in the event of medical emergencies or illness. Assisted Living costs in Crossville start around $4,450 per month on average, while the nationwide average cost of assisted living is $4,000 per month, according to the latest figures from Genworth’s Cost of Care Survey. It’s important to note that assisted living rates in Crossville and the surrounding suburbs can vary widely based on factors such as location, the level of care needed, apartment size and the types of amenities offered at each community. 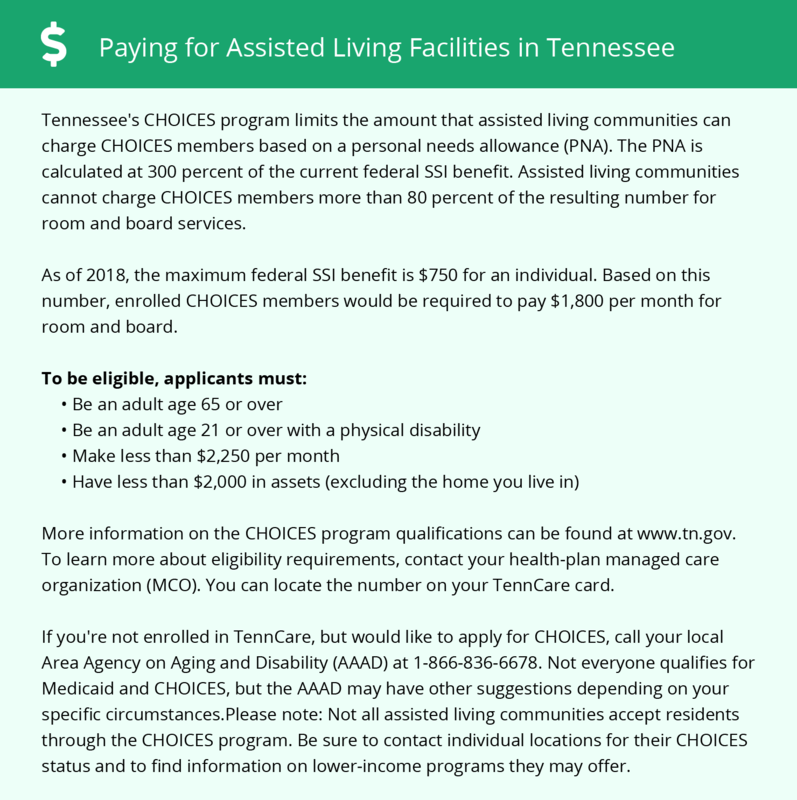 The CHOICES waiver helps pay for the costs associated with assisted living in Crossville. The Home and Community Based Services waiver helps some senior citizens who meet Medicaid eligibility to cover some of the cost of the assisted living. The waiver doesn’t provide help with room and board. Learn more about these programs, plus who’s eligible, on our Assisted Living in Tennessee page. For more information about different ways to finance assisted living, visit our Assisted Living in Tennessee page. Crossville and the surrounding area are home to numerous government agencies and non-profit organizations offering help for seniors searching for or currently residing in an assisted living community. These organizations can also provide assistance in a number of other eldercare services such as geriatric care management, elder law advice, estate planning, finding home care and health and wellness programs. To see a list of free assisted living resources in Crossville, please visit our Assisted Living in Tennessee page. Crossville-area assisted living communities must adhere to the comprehensive set of state laws and regulations that all assisted living communities in Tennessee are required to follow. Visit our Assisted Living in Tennessee page for more information about these laws.